Peppermint oil (Mentha piperita) is one of the strongest of the essential oils. The oil is extracted by steam distillation from the flowering herb and has many therapeutic uses. According to MedlinePlus, “Peppermint oil has been used historically for numerous health conditions, including common cold symptoms, cramps, headache, indigestion, joint pain and nausea." Always remember that the use of essential oils is a complement to and never a substitute for professional medical care. It is analgesic, anti-inflammatory and antis-spasmodic, so that it can not only relieve pain and inflammation but also calm the spasms that cause muscle cramp. Pain in the muscles is usually caused by either overworking them or by a strain or sprain injury. When the muscles are overworked due to partaking in some unaccustomed activity or by pushing the body too hard, lactic acid builds up in the muscles, making them sticky and hard to move. This is what causes the pain. 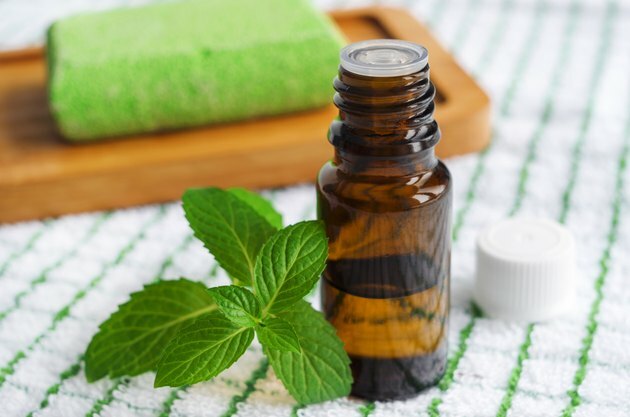 Massage is the most effective way to use peppermint oil to relieve muscle pain caused by too much strenuous activity. Massage warms the skin and the underlying muscles, and the manipulation of tissue disperses the lactic acid that causes the pain. The scent of the oils used enter the brain through the nose and the body through the skin and are carried right through the system in the circulation. MassageDen.com states, "Manipulation of the muscles through massage aids in loosening and relaxing stiffened muscles." A good blend of oils to use for massage is 2 drops of peppermint oil, 4 drops of sweet marjoram and 2 drops of sandalwood blended in 20 ml of sweet almond carrier oil. A cold compress is used to help relieve inflammation and swelling at a point of injury such as a strain or sprain, where massaging directly over the injured area is not recommended. Add 2 drops of peppermint to a pint of cold water in which six ice cubes have been dissolved. Soak a flannel in the water and then lay it directly over the affected area. The cooling properties of the ice and peppermint, along with peppermint’s analgesic and analgesic properties, will help to reduce swelling and discomfort. Add 2 drops of peppermint, 4 drops of geranium and 4 drops of lavender to a warm bath, lay back and relax. This is an excellent way to ease muscle stiffness and pain, as the body is warmed and the oils and aroma help relaxation and are absorbed through the skin. Peppermint should never be used undiluted on the skin or taken internally. If you have very sensitive skin, its use should be avoided. It is not recommended for use on children and babies under twelve years old or on the elderly.